What is Mabuhay Miles app? 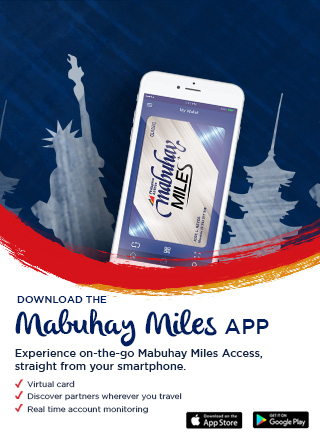 The Mabuhay Miles app is a new mobile app made available to both members and non-members. This showcases the wide range of partners available for earning and redeeming miles to enjoy FREE flights with Philippine Airlines. Do I need to be a Mabuhay Miles Member to download the app? The Mabuhay miles app can be downloaded by anyone interested in Philippine Airline's loyalty program. How can I log into my Mabuhay Miles mobile app account? Input your 9-digit membership number and the same password as your Mabuhay Miles website account to log in. To reset your password, click on the "Forgot Password" link on the app log-in page. Alternatively, you can visit the Mabuhay Miles website and under the "My Account" tab , click "Forget Password". What can I view in the app? The Mabuhay Miles app gives you a snapshot of your Mabuhay Miles account including your earned Miles and recent transactions done. You can view recommended offers, stores, and partners near you; set targets for your next trip and share it with your friends on social media. With the Mabuhay Miles app, you are also provided with a virtual membership card to present to our participating program partners and score the deals and discounts offered. You can access this app anytime, anywhere - full features are available when your device is connected to the internet. Please note that local data charges may apply, dependent on your mobile service provider. Viewing of user profile details and virtual card - track your recent transactions and earned Miles as of the last update online. Favorite offers - tag your top pick offers to keep you updated. Where can I manage my notification settings? You may adjust your notification preferences through the settings found inside the app. Can I book flights through the app? This feature is currently not yet available. Can I redeem miles through the app? Currently, Miles redemption is done when you contact our reservations hotline at (632) 855-8888 or by visiting the Mabuhay miles Service Center located at the Ground Floor Allied Bank Center, 6754 Ayala Avenue cor., Legaspi Street, Makati City. I have enrolled in Mabuhay Miles but I forgot my Membership ID. How can I retrieve it?